Shop Latin Percussion Aspire LPA244 Bongo Mounting Bracket from AMS and enjoy Fast & Free Shipping. Latin Percussion Aspire LPA244 Bongo Mounting Bracket; Free up some space by adding this mount to an existing stand. LP's Aspire Bongo Mount is a quick and secure option for mounting your bongos while still offering full adjustments for optimizing the use of your percussion space. Players can rest assured that this stand attachment will keep your bongos stable to ensure that they will not cause a commotion by falling during a quiet passage while freeing up much needed floor space giving you room to move. 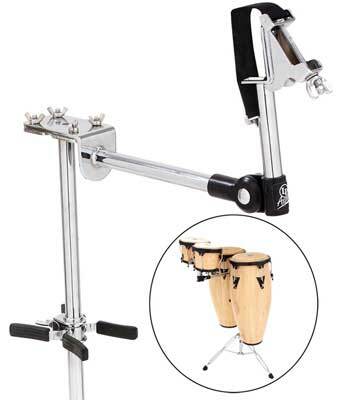 The Latin Percussion Aspire Bongo mount is ideal for adding bongos to LP Aspire or Matador double conga stands without requiring the purchase of a whole new stand. This mounting system connects by using LP’s strap-lock device that ensures rapid set up/take down, secure stability and a pivoting neck to offer precise positioning of bongo skins. The LP Aspire Bongo Mount has been designed-smart and affordable, much cheaper than adding another heavy-duty floor stand.